When it comes to ultimate super bikes, they don’t come much more ultimate than this, Suzuki’s GSX-R1100 is one of the biggest, most powerful, and awe inspiring superbikes ever built. Unveiled back in 1986 to enormous acclaim, the GSX-R1100 (like its pioneering smaller siblings, the (GSX-R750) has undergone many changes over the ensuring years. At its launch the big GSX-R was light, very powerful and wickedly fast. And over the years the Suzuki, pressured by competition primarily from Yamaha’s FZR 1000, piled no more and more power. But the trade off was more and more weight gained, and by the early 1990s the GSX-R1100 had become a muscle bound monster. Putting out 145 bhp in stock (but unrestricted) trim the GSX-R scaled over 500 lbs fueled up. That’s a lot of bike producing a lot of power. But now the GSX-R1100 has undergone another transformation and although it is still big heavy and fast, it is no longer the bad mannered behemoth it once was. Gone is the wayward handling and peculiar steering, replaced by an altogether more docile beast. What happened was the Suzuki was that Suzuki radically uprated the GSX-R1100’s motor, turning it from an oil-cooled to a water cooled affair. They did the same thing to the GSX-R750 in 1992 and the result was a biker that was better than ever, but not by much. The main cause for adopting water cooling is that it’s more competent, but because it’s quieter an important consideration in these days of increasingly stringent noise regulations. When it comes to sheer size, superbikes don’t come any bigger than Honda’s GL1500 Gold Wing. The leviathan of the two-wheeled world is the ultimate in motorcycling comfort, designed solely to transport two people in as much style and luxury as is possible. The Gold Wing has been around for two decades, during which time it has evolved from a fairly basic naked tourer into an everything-but-the-kitchen-sink machine for the discerning traveler. It began life as a 1000cc flat-four, grew to an 1100cc flat-four, a 1200cc flat-four, and finally into a 1500cc flat-six. Yes, six cylinders power this mighty beast, producing 98 bhp at 5200 rpm and a massive 110ft/ lb of torque at 4000 rpm. Despite weighing in at a hefty 800lbs dry, the ‘Wing is capable of top speed of 130 mph, although it takes its time getting there. But top speed isn’t what the Gold Wing is about. 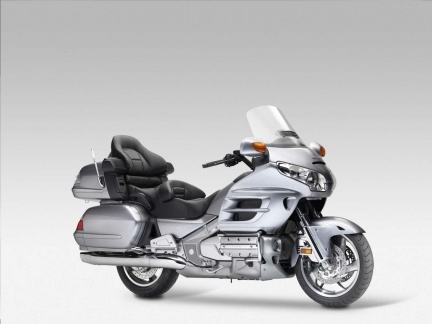 Smooth, effortless power delivery, luggage carrying capacity, and supreme comfort, are what the Gold Wing is all about. And it is justly famous for achieving its purpose. The barn-door-like fairing is large enough to keep the wind and rain off the rider (although internal vents in the fairing allow you to direct cooling air at yourself when the weather gets hot). The saddle is a masterpiece of the furniture makers’ art, coddling the behinds of rider and pillion, and adding to the almost total absence of vibrations from the engine to give the smoothest ride known to motorcycling. The Dyna Glide features Harley-Davidson’s latest chassis, which Harley themselves proudly claim is the result of computer aided design (CAD). But it’s a far cry from the exotic aluminium beam frames favored by the latest Japanese race replicas. This one’s steel, good ol’ US steel, a direct spiritual descendent of an earlier generation of America iron horses. But the frame is, in its modest way, a new departure for Harley-D as they progress ever-so-cautiously into the future. 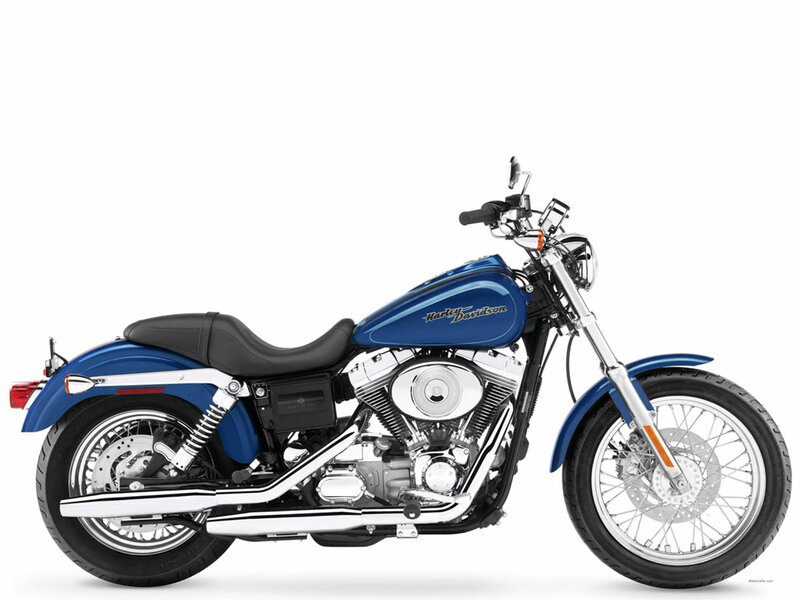 First seen on the 1991 Sturgis model, it features a refinement of the system of rubber engine mounting previously fitted to Glide and Low Rider models. And for the first time, it is possible for a normal person to ride a Harley at sustained speed without going numb from the wrists down. Purist might frown. The essence of any Harley is that pounding V-twin beat. Unlike the anodyne whirr of Japanese multis, you’re supposed to feel it. Dyna Glide’s endeavor to offer the best of both worlds: you can tell there’s 80 cubic inches of Milwaukee muscle down there, all right, but it doesn’t put your circulation in a sling. To ride, these are the smoothest Hogs yet, by a margin. Even sensitive souls will use power outside the Evolution engine’s hitherto rev-range without worrying that the entire bike’s about to fail to bits. Now you can happily ride at low revs where other Hogs quake and shudder. Or at high revs where your fillings used to be in danger of shaking out. Without laying a hand on the engine, rubber mounting has effectively widened the big Vee’s power band. 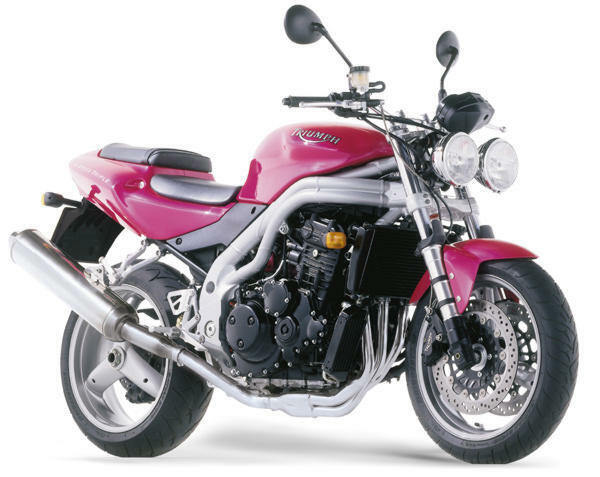 When Triumph rejoined the motorcycle manufacturing fray in the early 1990s the two wheeled world was impressed. And old and revered name had been applied to a thoroughly modern range of motorcycles and was being sold at prices that allowed Triumphs to compete directly with the Japanese factories. A few years down the line Triumph have expanded and revised their range, dropping models that didn’t sell well and introducing new ones they hoped would. The speed Triple is one such machine, one which has been received with open arms by the motorcycling fraternity. Whilst some manufacturers have gone all out at the retro market, aiming traditional looking machines at the born again biker, Triumph have taken a different approach. With speed Triple they have taken an existing Superbike from their range, the Daytona 900, taken off the fairing, and tidied up what is underneath to the point where it is aesthetically pleasing (not an easy thing to do with a modern water cooled motorcycle). The result is one of the leanest, meanest looking bikes around, a café-racer for the ‘90s, not a lash-up of bits and pieces designed to look like something from the mid-1970s. The engine of the Speed Triple is the same excellent unit that powers a whole variety of Triumphs, from the Trophy 900 to the Daytona 900. it is a water cooled DOHC 12-valce in-line three cylinder that puts out 98 bhp and 60 lb/ft of torque, enough to dispense with one of the usual six gear rations. Not massive numbers for a 900, but sufficient to give Speed Triple a top speed of 140 mph.